Adult Swim's definitely-not-for-the-childrens cartoon series Rick and Morty is one of those shows that will leave you either aghast, horrified, and repulsed, or aghast, horrified, repulsed, and delighted. The misadventures through the multiverse of a brilliant but self-destructive scientist and his perpetually sweaty and put-upon grandson have proven themselves funny, unapologetically violent and profane, but also smart, touching, and insightful when you least expect it. 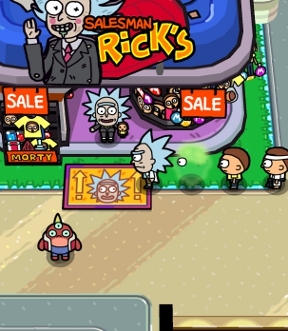 And, well, now it's on your phone, in a way, in Pocket Mortys, free for iOS and Android thanks to the talents of Adult Swim Games and Big Pixel Studios. It's an interdimensional RPG adventure that looks fantastic and is easily accessible by just about everyone, though fans of the series might long for a little more meat on its bones thanks to some seriously toned down content and a simplified RPG formula. As the game opens, our heroes find out Mortys have become separated from their Ricks all across the dimensions. But why? And by whom? Well, before they get a chance to find out, Rick and his Morty are brought before the Council of Ricks and accused of the crime themselves, and to prove his innocence and get his portal gun back, Rick challenges the Council to a battle... by which I mean he plans to travel the dimensions, finding lost and feral Mortys, capturing them, and training them up to fight one another for him. Sound barbaric? Morty thinks so too, but hey, Mortys are the new craze sweeping the multiverse, and literally everyone is in on it! If you've played Pokemon, then you can play Pocket Mortys, since they're basically the same thing only with more beleaguered teenage boys. Mortys duke it out in turn-based fashion, coming in literal Rock, Paper, and Scissors types that are stronger or weaker against each other, and each move has Ability Points tied to it, so you can only use it so many times before you need to heal up. Defeat enough Ricks and earn their badges to take on the Council one by one! Wild Mortys can be caught if you have the right equipment to fill up your Morty Pad (with a whopping 82 types of Morty to find! ), and you'll also be granted a random one whenever you spend a Blips and Chitz coupon, in addition to a random assortment of items. You'll get one of those coupons for free each time you defeat a member of the Council of Ricks, or you can choose to pay real cash for them with optional in-app purchases. As for Schmeckles, used to spend on various items at the shop, you can choose to watch short ad videos for 30 of them at a time, though you'll get them from battles and as rewards, too. The random items you find like cables, circuits, and, um, fleebs can be combined at crafting stations to make useful things, though you'll have to discover the recipe combinations yourself. Since you need to earn an increasing number of badges to challenge each new Council member, you'll burn through a lot of dimensions and battles, making catching and training Mortys your primary focus. While it's easy to get swept up in the siren call of Mermaid Morty or the, uh, allure of Geriatric Morty, don't forget your little original Morty can be helpful, too. He doesn't have a type, so while he isn't strong against anything, he isn't weak against anything either. From the central hub, where you can find the Morty Day Care for your unused Mortys and what is apparently the multiverse's only Healing Center, the portal takes you to a random dimension. 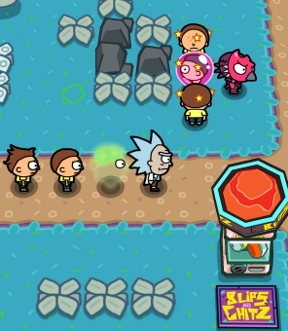 In each one, you'll find a randomly generated assortment of Morty trainers, wild Mortys, items to find, and of course, a Rick that needs to be defeated to earn a badge. It's a lot of grinding all around, and while it undoubtedly would have been a lot more work for the developers, I found myself craving more structured dimensions with defined characters and encounters, instead of endless mono-hued fields and flora, though you can find Bird Person just hanging around the main hub. Sadly absent is a function to allow you to curl up at his feet and stare at nothing for a while. The random generation can kick you a little as the player, too. The cost per healing item versus what you get for winning battles feels a little unbalanced, especially since the types of crafting items you get and thus the usefulness of what you can make out of them is random, so you may find yourself watching a lot of (short!) 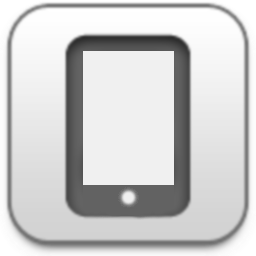 video ads to earn those free Schemckles to heal your team in the field. Despite this, Pocket Mortys' monetization is surprisingly tame. You won't really find anything in the coupon prizes you won't gather on your own in the same amounts, so the only reason to pony up some cash is if you, you know, feel like throwing the developers a few bucks for a job well done. As far as tone and content goes, however, compared to its, eh, rambunctious source material, Pocket Mortys is pretty tame. No profanity, no ultra-violence, no oh no oh no I can't believe they did that OH NO or moments of unexpected thought and insight, and an overall lack of real banter between the characters makes Pocket Mortys feel almost too toned down to pull in a much wider audience, which is odd considering that the show itself isn't even in the same dimension as "all ages". The snarky, cynical self-awareness of the free online "rushed licence" point-and-click game would have been a great fit here. "We-we gotta follow him, Morty! Into the p-pOOOOoorGHtal! Oooh, it's g-gonna be a r-real exciting adventure or whatever, Morty, yeah! Yeah. That's fun, right? We're gonna... gonna get 'em all, Morty, 'cause if we said the words catch and 'em and all tOOGHether, that'd be a lawsuit waiting to happen." Fortunately, Pocket Mortys' presentation is pretty excellent. The differences between some Mortys can be minor (Blue Shirt Morty? ), but others can be laughably weird, like Veiny Morty, but they're all rendered in a fantastic, vibrant style. 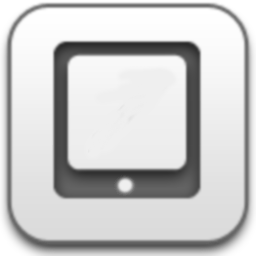 On the whole, in fact, the visual design is stellar, eye-catching in all the very best ways, and the interface is easy to navigate. The soundtrack is... fairly random, though not unpleasantly so, cycling through everything from a mellow acoustic guitar to an instrumental version of the duo's planet-saving megahit. Pocket Mortys may not be the expansive, deep, canon-expanding adventure you've been craving, but it's far from shabby, either. The pared down Pokemon-style battle mechanics makes balancing your team of Mortys (up to six on hand, with many more in storage) a lot easier, and thus you can keep hold of your favourites longer instead of having to shunt them out to make room for a Morty more powerful. While figuring out useful crafting recipes takes trial and error, and the ability to sell off some of your junk would not have gone unappreciated, it still feels useful and gains you access to a wider variety of helpful battle items. 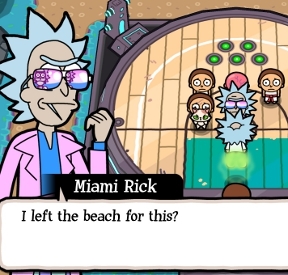 Pocket Mortys is, simply put, a rock-solid little casual RPG that, it must be said, is almost too cute to be believed, which is kind of a feat for a game about a critically depressed alcoholic and his most certainly deeply traumatized adolescent grandson. It's weird, but in a good way, and heavy on the charm, with a few appearances from other characters now and then throughout. If you're looking for a gleefully strange RPG you can pick up and play in your spare time, while at once also filling your pockets with tiny Mortys, then Pocket Mortys is an easy game to recommend. 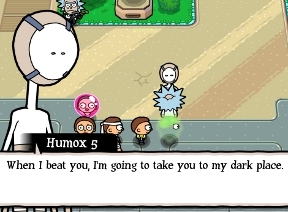 Pocket Mortys Walkthrough now available! This is a list of only the Mortys that can evolve when combined. Note: To evolve Egg Morty into One true Morty, the egg needs to reach level 20.